Hélène Darroze, the two Michelin-starred chef from Landes, resident at The Connaught, and one of the best known figures on the London fine dining scene, needs little if any introduction from me. I visited the eponymous restaurant at The Connaught to try her magnificent weekend brunch (reviewed here), and was pleased to return recently to see Hélène for a very special lunch where she paid homage to, and brought some of her top suppliers to a wider audience. 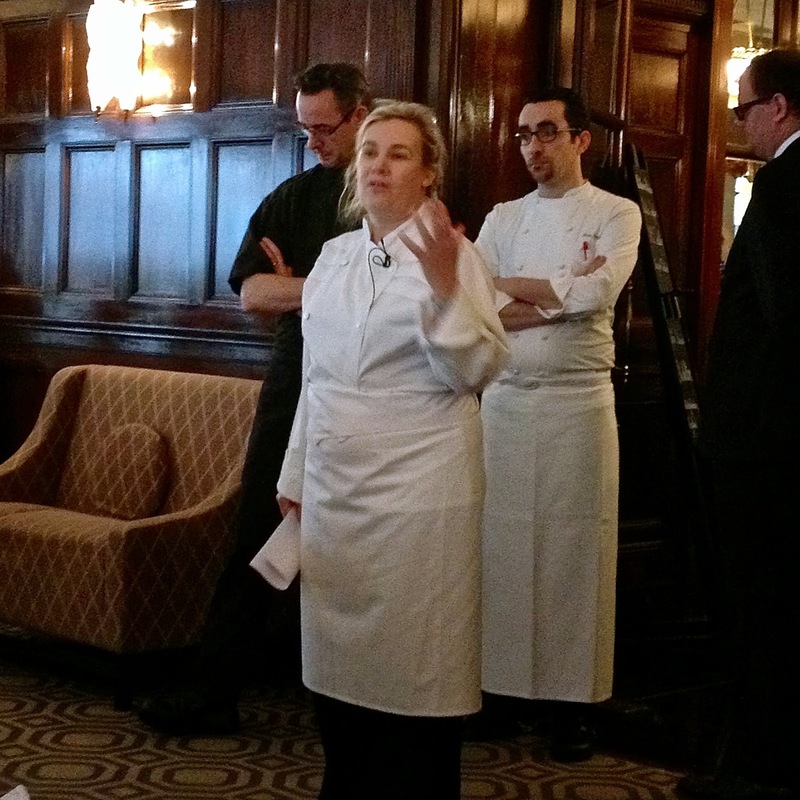 As Hélène explained in her introduction to the lunch, she owed much of her success to her suppliers. 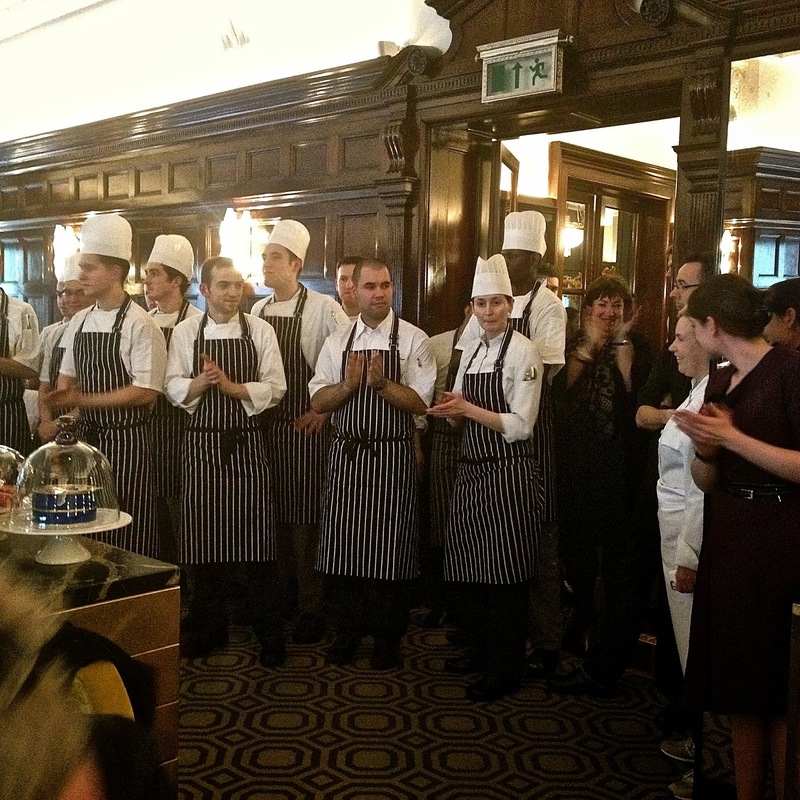 Without their support and the close relationships that have been nurtured over the years, she would not have been able to bring her cooking to the tables at The Connaught with such consistent quality. Despite her celebrity chef status, Hélène is a down to earth and easy person to talk to, and I looked forward to seeing her again. On this recent visit, I learned of Hélène’s two adopted Vietnamese children, of her growing interest in the cuisines of Asia, and how she is bringing these flavours into her French cooking. 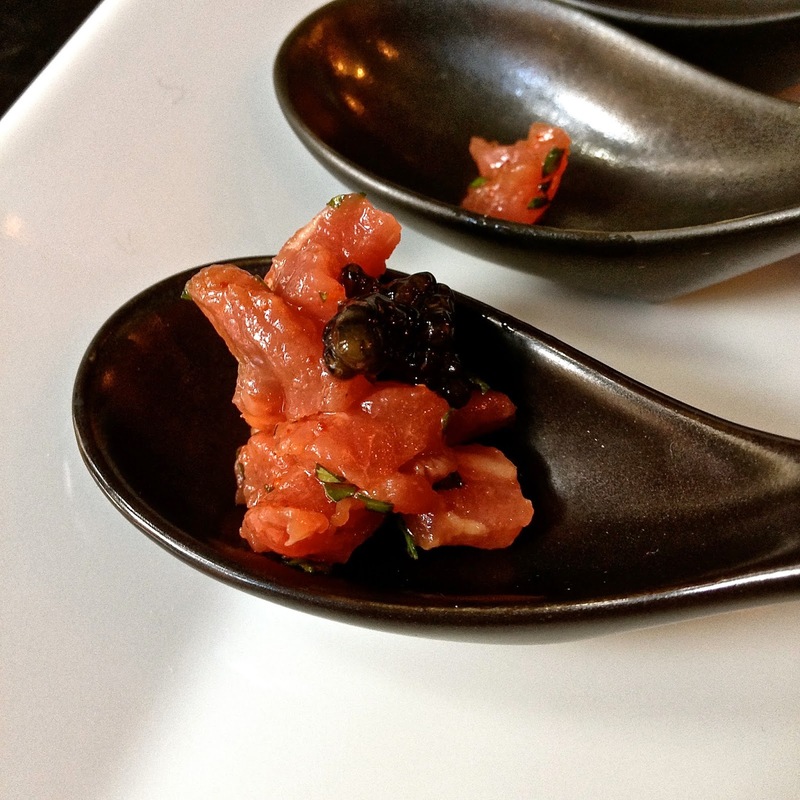 One such example was a lovely canapé of hand-chopped steak tartare, simply seasoned with a refreshing Japanese Ponzu dressing and thinly sliced coriander, topped with black caviar selected by Kaviari, one of Hélène’s suppliers. 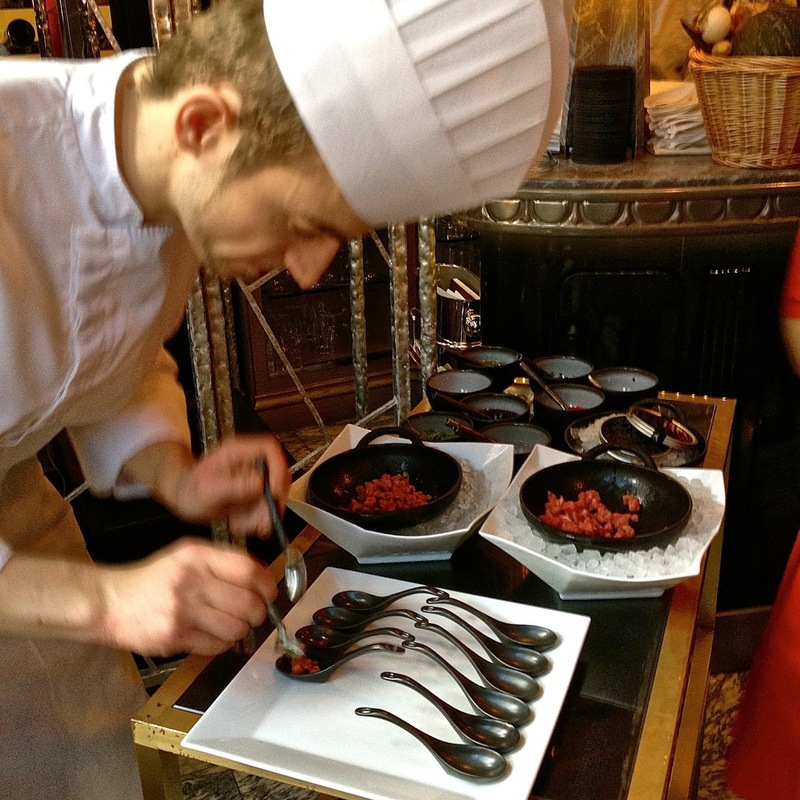 I am a steak tartare obsessive, but having it with ponzu and caviar was a first for me - what a revelation! Canapés and bubbly were followed by a sit down lunch, at which the guests were split over various tables, each having one of Hélène’s suppliers. At our table, I got to meet Alex McMullan, the lobster supplier from Northern Island. Interestingly, he told me that Hélène is his only customer in London, and that all his lobsters and crustacea that do not sell locally are shipped to France. To introduce Bernadette Cassagnau of Béarn and her white cocoa beans, we kicked off with a martini glass filled with chopped Fine de Claire oysters in jelly, topped with an ultra-light and creamy white cocoa bean mousse. 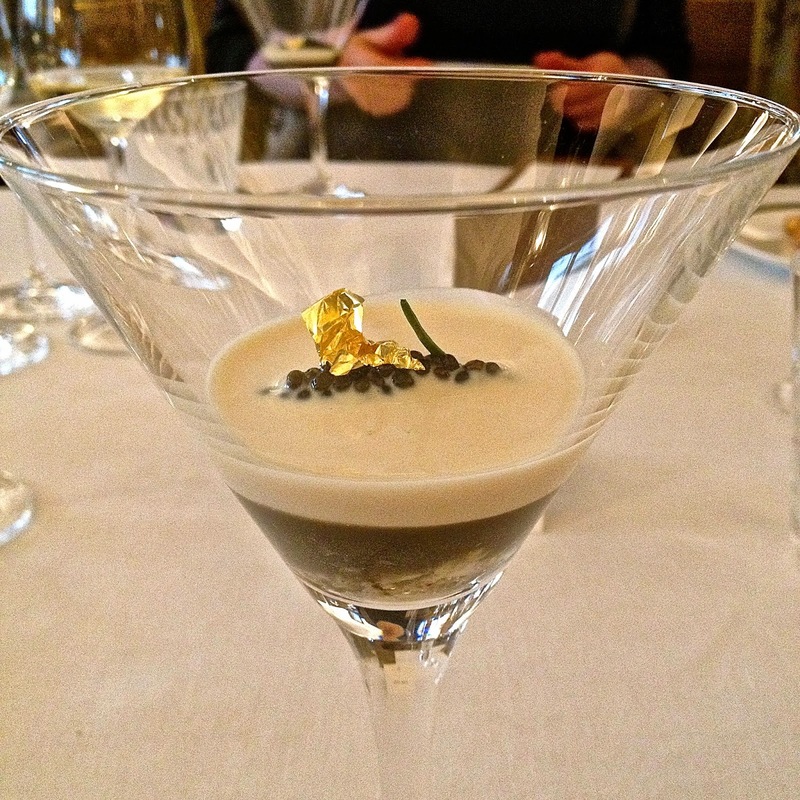 A dollop of Kristal caviar by Kaviari and a leaf of gold finished off this stunning creation. The combination of white chocolate and oyster was both daring and wonderful. It showed great sophistication, and was a fitting start to the meal. Our next dish was Alex McMullan’s much anticipated Northern Irish lobster. 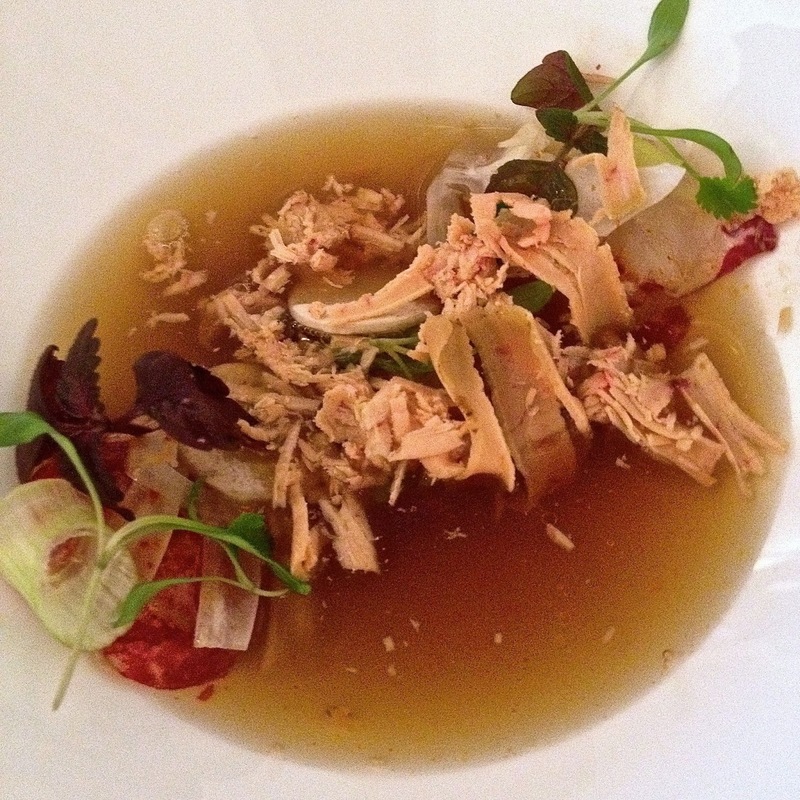 Served in a highly concentrated, crystal clear lobster consommé, it was partnered with champignons de Paris, fine shavings of foie gras, coriander and baby shiso leaves. The combination of lobster and foie gras was again unusual but exceptionally good, as was the addition of coriander and highly aromatic shiso leaves in this dish, evoking some of the best known flavours of Asia for me. To partner both these dishes, we had a glass of 2009 Bourgogne Aligote by Pierre Morey, which had enough fruit, body and weight to perfectly match our first two starters. The XXL scallop by David Price from Scotland followed - this was one of my favourite dishes of the lunch. 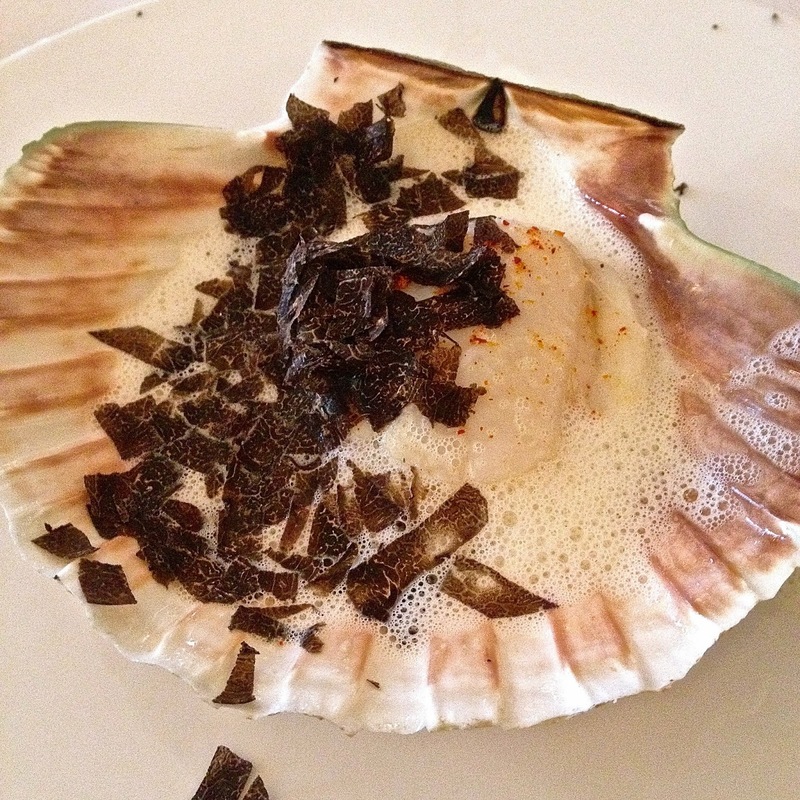 A large meaty scallop was perfectly cooked, and served with a warm Parmigiano Reggiano foam and generous shavings of heady black truffle. Cleverly put together, these simple, familiar flavours combined to create a form of culinary alchemy. The hake by Anne-Marie Vergés of Saint-Jean de Luz was our next dish. 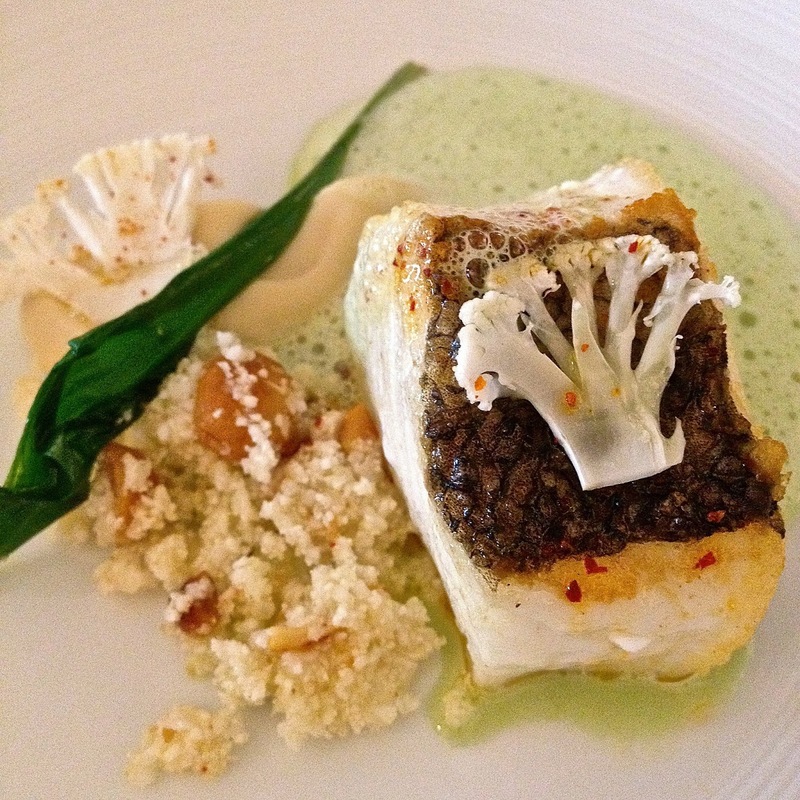 A chunky fillet of hake was simply pan-fried and served with crumbled hazelnut, truffled mash, wild garlic foam and crunchy, paper-thin slices of cauliflower. I loved the many layers of flavour and texture in this dish, so ingeniously combined. We enjoyed the scallop and hake dishes with a glass of 2012 Cuvée des Conti, Tour des Gendres, which was again a magnificent choice for both the scallop and hake dishes. The pièce de resistance was, however, yet to come. 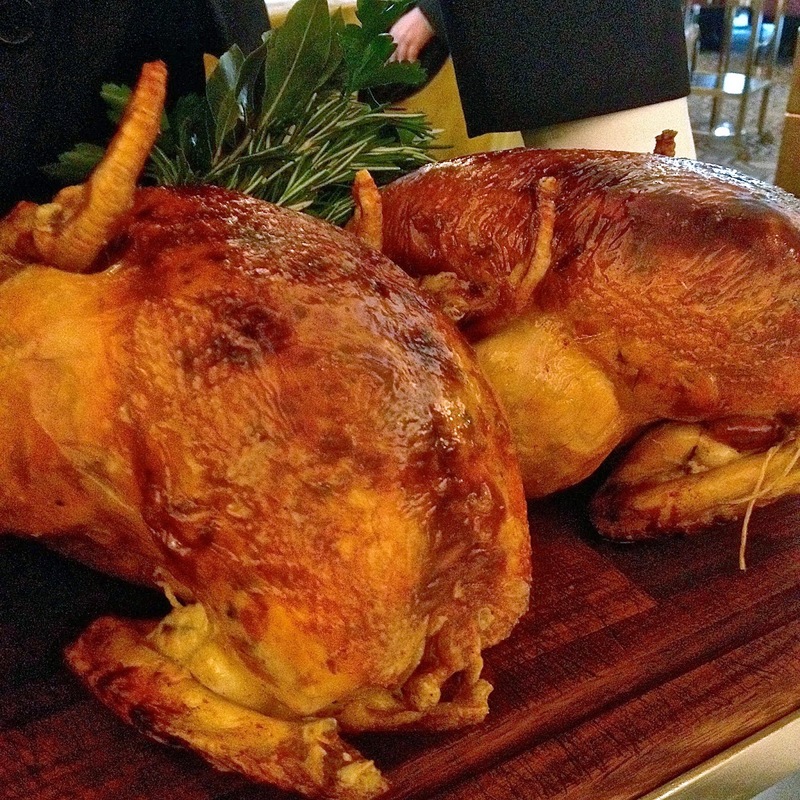 Arnaud Tauzin’s magnificent chicken from the Landes is the Rolls Royce of the poultry world. I had a brief chat with Arnaud, who told me that he only sells the smaller and more flavoursome female chickens for consumption. Hélène Darroze is his only UK client, with the rest of his production being sold either locally in the Landes or to selected butchers in Paris, where each chicken retails for a whopping €45. Chicken is a dish I hardly ever order in a restaurant, since it can be such non-descript meat in the UK. 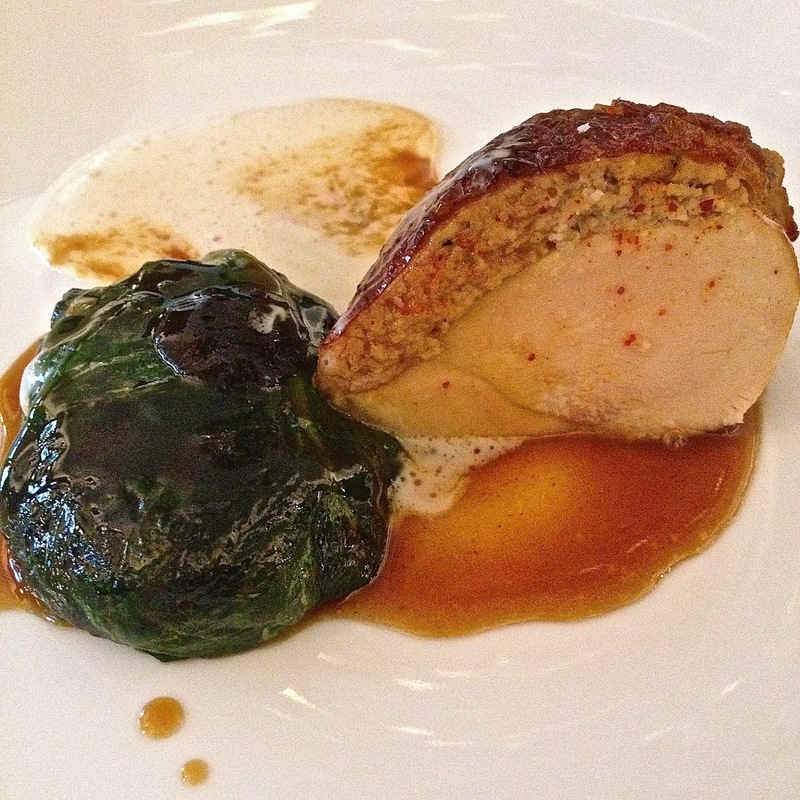 Arnaud’s chicken was among the best I have ever tasted, roasted and served with a highly concentrated glossy jus. The chicken had been stuffed with black truffle between the skin and the flesh, “cogollos”, potato and served with a creamy sauce made with “Vin jaune d’Arbois”, a French “yellow wine” akin to Fino Sherry but not fortified. To accompany the chicken, we had a glass of 2010 Barbaresco Vigneto Valeriano from La Spineta. The rhubarb supplied by Janet Oldroyd of Yorkshire was put to good use to create Hélène’s Forced Rhubarb dessert. 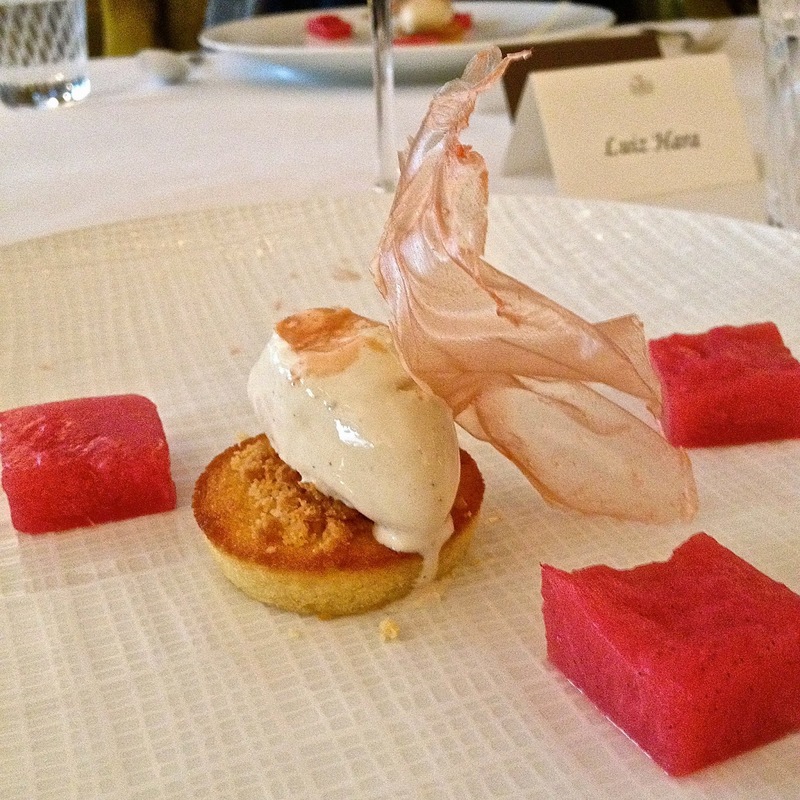 A light and creamy rhubarb ice cream was placed over a freshly baked rhubarb financier, and served with crumbled almonds and a feather light rhubarb caramel tuille. The dessert was exceptionally light and refreshing, wrapping up proceedings with a real flourish. I enjoyed a glass of 2012 Gaillac, Grain de Follie Douce from Domain Causse Marine with the dessert. 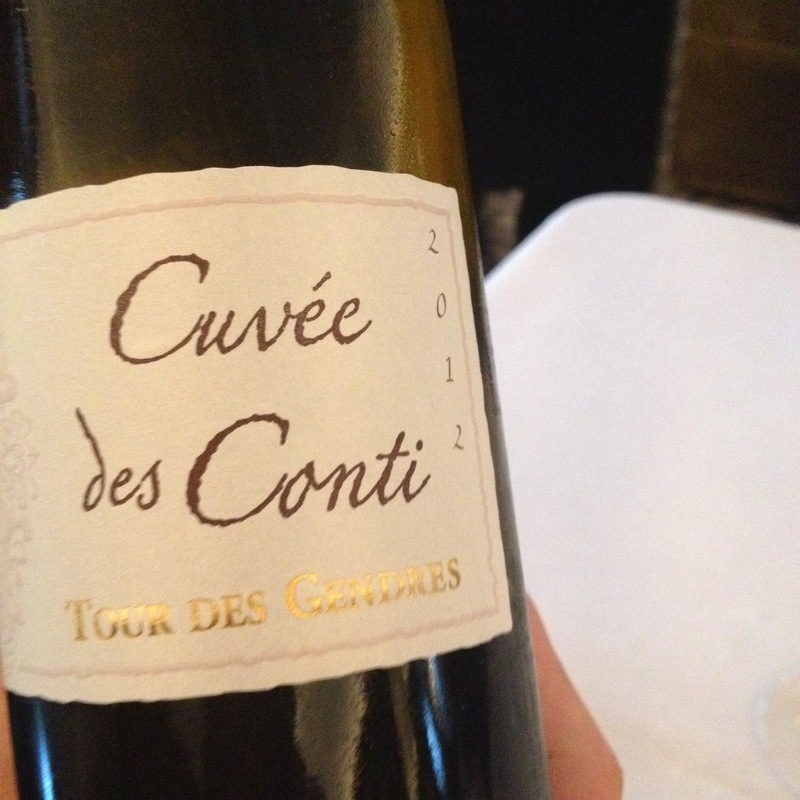 For me, it was good to see this lesser known wine region represented in the dessert wine list. It is a wine I remember fondly from my trip to the Tarn and Gaillac a few years ago. In addition to the suppliers mentioned so far, noteworthy also were the all the vegetables for this meal, which were supplied by Joēl Thiebault, as well as the Espelette pepper by Mattin and Xabi Catanchoa, used in many of the dishes. 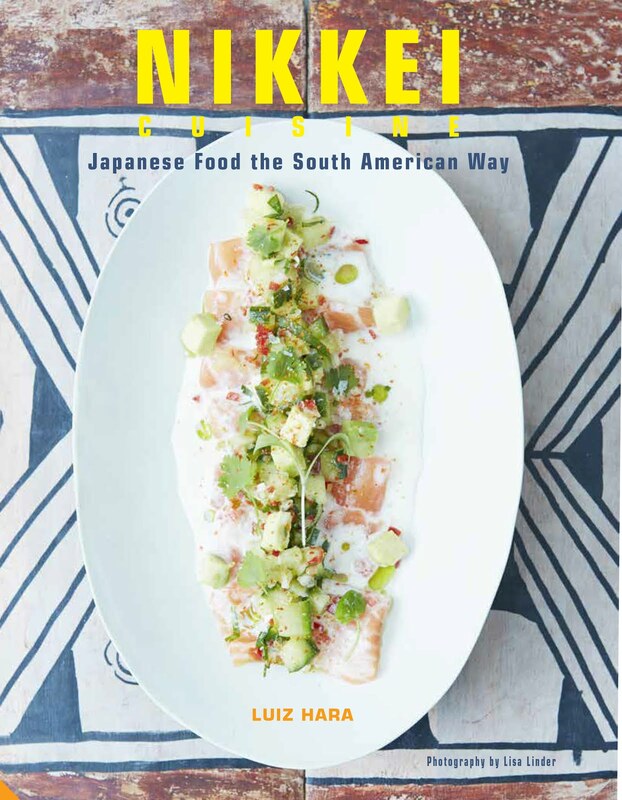 I thoroughly enjoy Hélène Darroze’s cooking - her creativity and sophistication of palate knows no bounds. But it was her generosity of spirit, humility and her publicly expressed gratitude to those who have supported her in her work that really struck a chord with me on this latest visit. 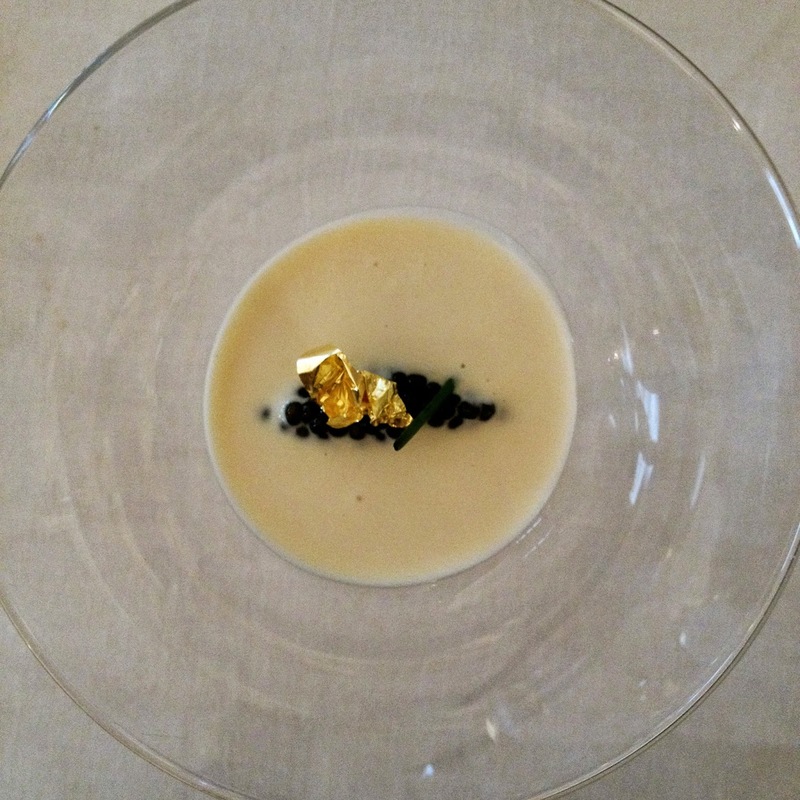 If you have not tried Hélène Darroze’s cooking at The Connaught yet, I highly recommend it. If you have, it’s well worth a revisit. 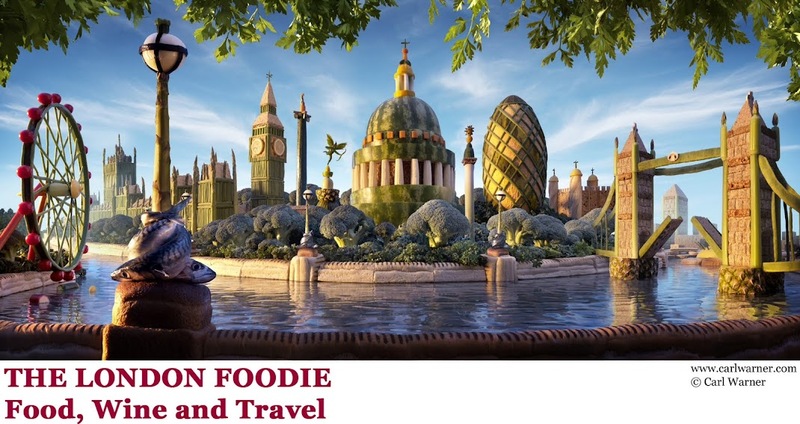 Her brunch is also one of the most fabulous ways to spend a weekend in London. 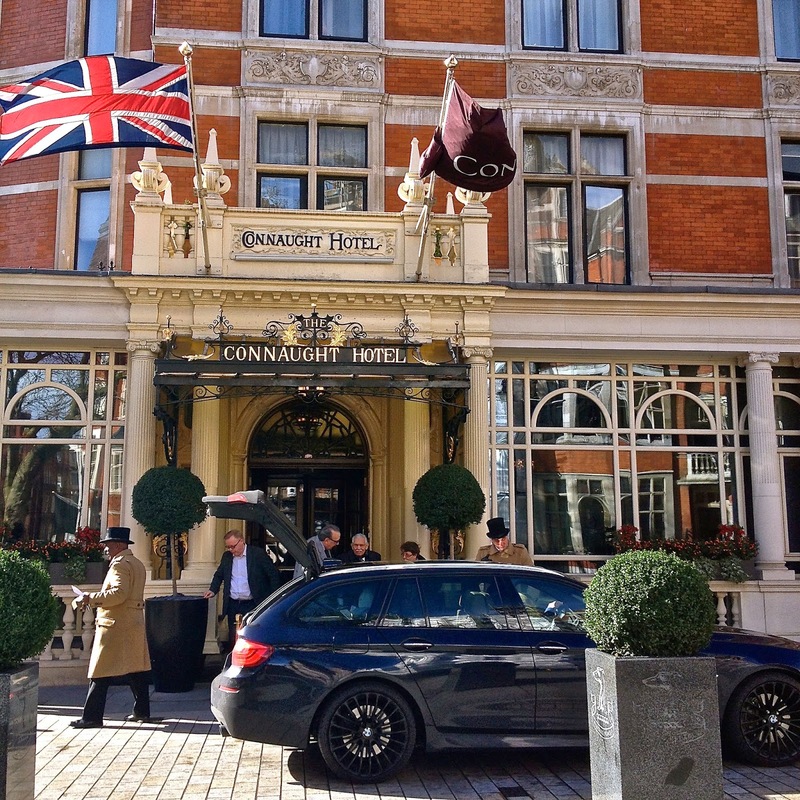 For more information about Hélène Darroze at The Connaught, visit their website here.